Ready to annoy everyone on campus? Sure you are! This backpack will do it in a hurry. The Skullcandy LINK backpack has speakers integrated into the backpack straps along with a microphone. 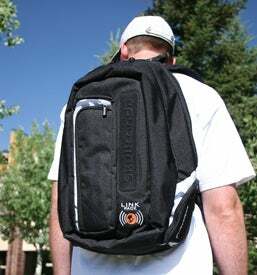 The backpack will hook up to your cellphone and MP3 player. Music plays back through the speakers and when a call comes in you can reduce the music volume and then accept the call, hands-free. It includes the option of using a headphones or a headset, and unless you want a barrage of swirlies, you better keep your calls and music to yourself. It retails for $130.